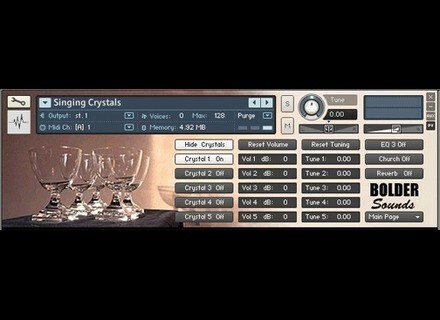 Crystal Glasses V2 Kontakt, Other CD & Sound Bank from Bolder Sounds. The crystals recorded in that library date back to the mid 1990’s when 16 bit mono samples was the standard format. Hit Crystal Glasses - (3 round-robins per sample zone). Soft Hit Crystal Glasses - (2 round-robins per sample zone). Singing Crystal Pads - wet finger along rim of glass. Granular Crystal Pads - Ethereal pads created via granular synthesis. Bowed Crystal Glasses - Both short and long articulations. Crystal Morphs - Kontakt multi instruments which morph between individual instruments. Scripting for Kontakt giving the user an elegant and intuitive user interface. Help menu built into the Kontakts front panel. Full version of Kontakt SAMPLER 3+ required. Will only run on the Kontakt PLAYER for 30 minutes in demo mode. VSL Updates Vienna MIR VSL has updated Vienna MIR to v1.1-1719.